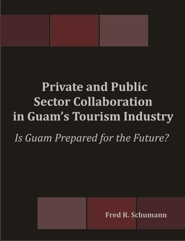 Private and Public Sector Collaboration in Guam’s Tourism Industry: Is Guam Prepared for the Future? Is Guam Prepared for the Future? The topic of tourism development has been explored by a number of scholars and increasingly, over the past decade, more literature has become available on tourism development on small islands . For many of the small island territories or nations, they share a number of major issues in the area of tourism. These include vast distances from source markets, foreign investment and the resulting leakage of revenue, over-dependence on tourism (mono-structured economy), dependence on imports, and an overburdened infrastructure, just to name a few (Gössling 2003; Harrison, 2004; McElroy, 2006). Most island destinations rely on stakeholders from not only a single sector, but from both private and public sectors to tackle these issues (Buhalis, 1999). As a tourism-dependent economy, Guam receives at least sixty percent of its governmental revenues from tourism. Japanese visitors had made up over 80 percent of Guam’s visitor arrivals in earlier years, but numbers started to drop in recent years due to a number of reasons, such as natural disasters, world events, as well as stiffer competition from similar resort destinations. Still, the market remains the largest source of visitors for Guam, with South Korea coming in a distant second in ranking making up approximately 12 percent of Guam’s visitor arrivals. As background information to illustrate the importance of public and private sector collaboration efforts on Guam, this research examines some of the changes occurring in Japanese overseas travel. It also reviews how tourist industry stakeholders in a nearby destination like Guam can adopt strategies to meet the changing expectations of this important market. The primary research of this thesis involves the analysis of qualitative data generated from in-depth interviewing in examining the issue of collaboration between the private and public sectors as a method for assisting Guam’s tourism industry to prepare for the future. This is followed by multiple case research (Yin 1994) that investigates strategies used in destinations to enhance tourist experiences through attractions. The SWOT Analysis is also utilized as an example of a tool to assist stakeholders in understanding the environment of the present to prepare strategies for the future. Fred R. Schumann holds a B.A. in History from Western State College of Colorado, an M.A. in Asian Studies from the University of Oregon, and a PhD in Asia Pacific Studies from Ritsumeikan Asia Pacific University. His dissertation deals with modern Japanese society and overseas tourism, with a focus on how current changes in society affect consumption and leisure habits. Currently, Dr. Schumann is teaching with University of Maryland's Asian Division (Maryland in Asia) in Guam. He teaches Asian Studies courses for the Division.